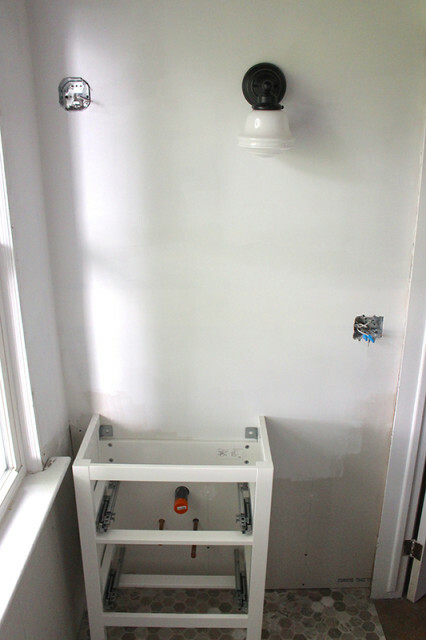 We’re slowly getting closer to finishing the powder room and I thought I’d pop in on this rainy day to share an update on how things are going. We took almost a little hiatus from working on this room while we did our Farmhouse Master Bedroom Makeover for the One Room Challenge, but now we’re back in full swing. The break actually gave us some time to mull over different decisions and order the last few things that we still needed. It feels like we’re getting closer to my inspiration board! Last time I shared this space, we were in the middle of tearing down decades of drywall, wallpaper, old flooring and even some 1920s & 40s newspapers. 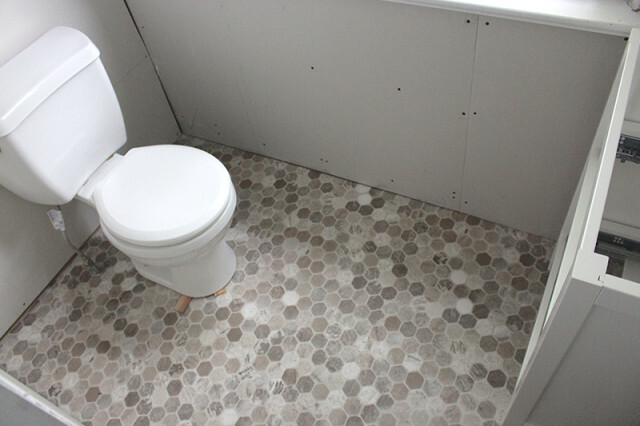 Since then we’ve added a new subfloor, vinyl floor, plumbing, electrical and drywall. If you follow my Instagram Stories, you know I was learning how to mud drywall and did this space by myself (with the assistance my dad as my teacher). I only did the top half of the walls (where you can see the primer here), as the bottom half will have wainscotting all the way around. You can see here where the new sink will sit, with an antique mirror above it and two wall sconces on either side. I’ve only got one up so far, but I think you can see where we’re going with this. 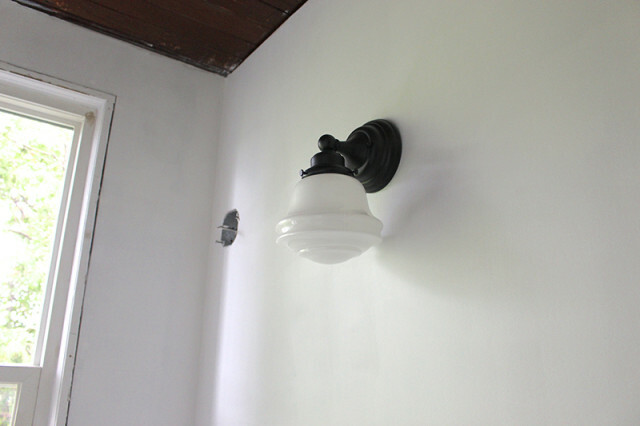 I fell in love with these wall sconces I found at Wayfair.ca. They’re sold out there now, but you can find them on Amazon too in seeded glass. They’re the perfect old schoolhouse look to fit in with the era I’m most inspired by in this house – early 1900s-1930s. We’d debated adding pot lights as well, but it felt like overkill. 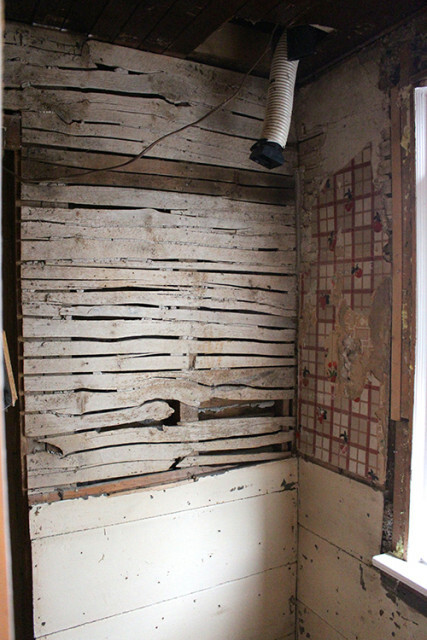 I had big dreams to restore these original ceiling boards we’d uncovered, but after looking at them up close, we decided that for all the time it would take to refinish them, we’d be better to replace them with “new” old boards. 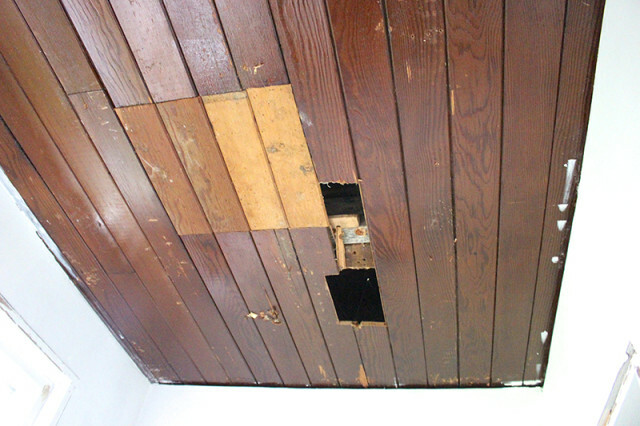 Sometime this summer we’ll be getting some lovely tongue-and-groove pine boards from an old cottage that is being torn down nearby and we’ll be putting them right over top of this ceiling. It will still look like the original one, but without the massive holes. Once we add the new crown molding (just like what we did in the master bedroom), it will look like they’re always been there. The greatest change we’ve made to the space to brighten it up is this new vinyl floor. 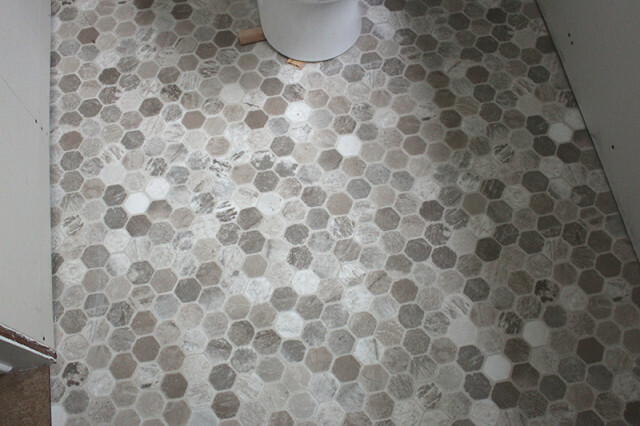 I first spotted this pattern in grey in a bathroom that my friend Kim of NewlyWoodwards did last year and it’s been on my mind ever since. It’s called “Rich Onyx” by Tarkett Flooring and we were able to find it at a local flooring store. I was able to find the same pattern in a lovely warm tone that goes well with the brown vinyl in our kitchen and dining room (which isn’t going anywhere anytime soon). We put down a new 3/4″ plywood subfloor and then glued the new vinyl down ourselves with adhesive from the flooring store. It took Garrett and I all of thirty minutes to do it together – easiest part of the reno so far and it dramatically changed the room. It was one of those moments where we felt like we’re actually going forwards and not backwards, ha! If you recall, the room looked like this when I shared the demo work back in February. 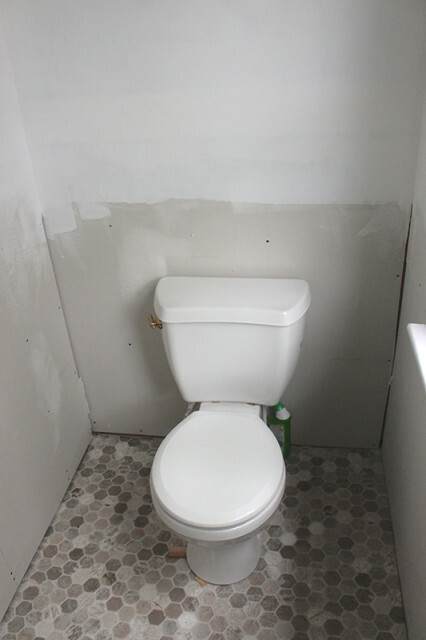 Now that same spot has fresh drywall and even the toilet is in place! 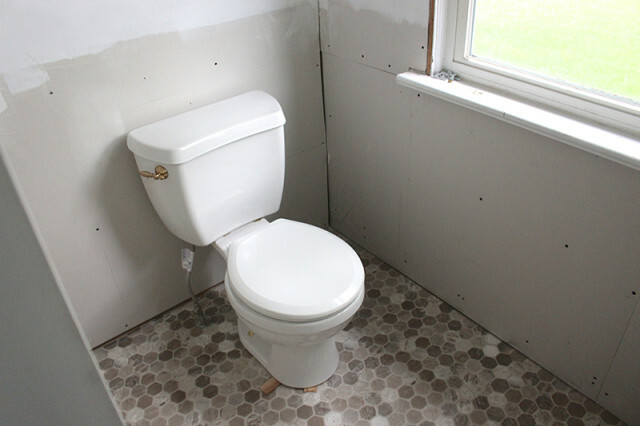 With Lucy’s birthday at the end of May, we knew we wanted to at least have a functioning toilet on the main floor, even if we couldn’t get the room finished in time. Garrett even added the new Delta toilet handle when he installed in. I cannot wait to have this finish on all the powder room fixtures. It’s their Victorian style in “Champagne Bronze”. I have to admit that I’ve been a little nervous about the layout. I kept fretting over there being enough space to get through the doorway, but thankfully when we propped up the new sink cabinet, there is still plenty of space to get into the room. It’s tough when you’re working with a very limited room configuration. 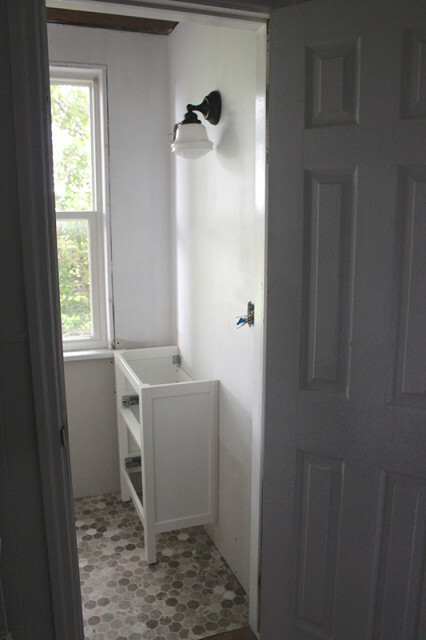 Your bathroom renovation is looking awesome! I particularly love the toilet handle. I am assuming that you purchased it separately from the toilet? I have always loved gold’s and antiqued gold’s. 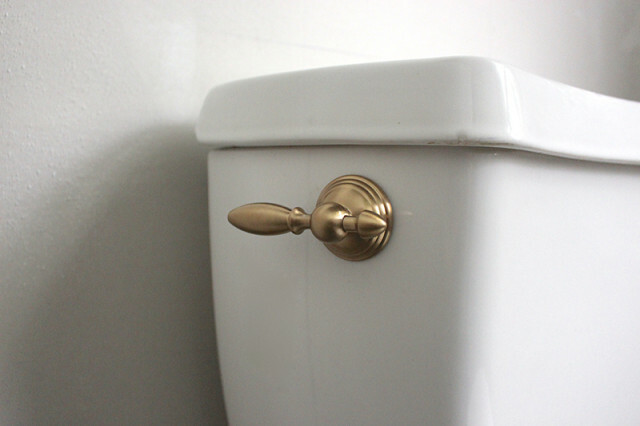 Since our toilet came with a chrome handle I painted it antique gold. However the finish is not holding up. I never knew that you were able to purchase upgraded handles. Many stores carry Delta products, just not sure who carries this handle. Whereabouts did you purchase it? Thanks in advance and keep up the wonderful Reno’s on your beautiful farmhouse! ?